Are you still manually entering weight readings from your scale or balance on your PC? Is your scale equipped with a RS-232 or USB (virtual COM port) interface? If yes, you can eliminate manual data entry by connecting your scale to your computer and using our free software 232key. 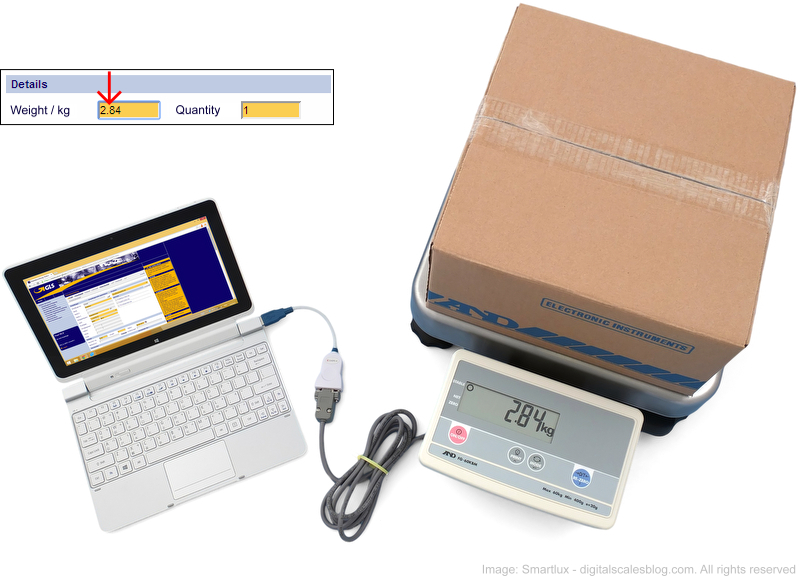 Our software runs in the background, listens to the COM port (serial port) your scale is connected to and waits for measurement values sent by the scale. Those values are then filtered, formatted and typed into the application running in the foreground at the current cursor position as simulated keystrokes. This means that 232key can be used to transfer the weight (or other measurement values) into any application that accepts keyboard inputs, e.g. Microsoft Excel, OpenOffice / LibreOffice Calc, Google Docs, a form on a website, etc. To use 232key, you’ll need a scale with a RS-232 interface (aka. serial port, COM port, EIA-232) or an interface which appears as a (virtual) COM port when the scale is connected to your PC. This is the case for many (but not all) scales with a USB interface and for scales which support the Bluetooth Serial Port Profile. Your scale or balance also has to send the weight in ASCII format. The weight has to be the first numeric value sent* and it should only be sent once (after you’ve pressed a key on the scale), not continuously. The vast majority of scales and balances available on the market today fulfills these requirements. Just to give you a few examples, you should be able to use 232key with most or all scales and balances made by A&D (RS-232 only), Adam Equipment (RS-232 and USB), Ohaus** (RS-232 and USB), Kern**, MyWeigh (RS-232 only) and other well-known brands. New device profiles are constantly added! We designed 232key to make your life easier. No complicated configuration is required. If your scale manufacturer or model is included in the list of predefined devices, you don’t even have to manually enter the interface parameters: Simply select your scale and click on “Default” to load the settings. Not sure which COM port you scale is connected to? Press the “Auto” button and 232key will try to detect the port automatically (works with all devices which have some sort of hardware handshaking functionality, e.g. scales and balances made by A&D and MyWeigh’s popular HD series). Do you know which decimal separator (point or comma) your scale is using? Why should you! 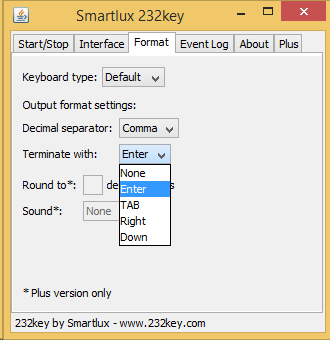 232key understands both input formats and lets you choose which output format you want. Would you like 232key to press an additional key after typing the weight, e.g. the “Enter” key to jump to the next row in a spreadsheet? No problem, simply specify the desired key in the “Format” tab. All of these useful and user-friendly features are available for free! 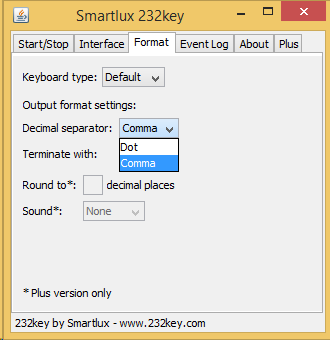 Additional functionality is available in the paid “Plus” version of 232key. Please visit our product website 232key for further information and to download our free software. Should you have any questions or suggestions, please don’t hesitate to post them in our support section or as a comment below. * We’ve added an exception to this rule for scales and balances made by Adam Equipment. 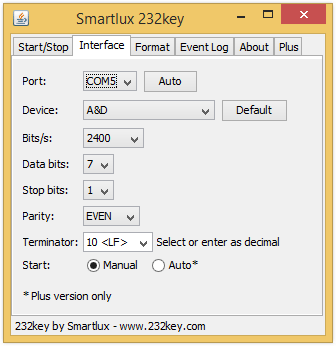 232key is a great solution for sending the weight from your scale to an application running on your PC (as simulated keystrokes). In some cases, however, it makes more sense to record the weight to a file which is later opened in Excel (or other applications). This is particularly true for unattended data logging applications running over long periods of time. Another example are applications with high data rates (several weight values per second) which would overwhelm a virtual keyboard wedge like 232key. For these use cases, we’ve recently released Simple Data Logger, an easy to use solution for recording the weight sent from your scale to a CSV file. You can read more about it on this blog or on www.smartlux.com/sdl.